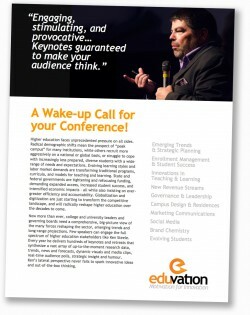 A Wake-up Call for your Conference! Higher education faces unprecedented pressure on all sides. Radical demographic shifts mean the prospect of “peak campus” for many institutions, while others recruit more aggressively on a national or global basis, or struggle to cope with increasingly less prepared, diverse students with a wide range of needs and expectations. Evolving learning styles and labor market demands are transforming traditional programs, curricula, and models for teaching and learning. State and federal governments are tightening and refocusing funding, demanding expanded access, increased student success, and intensified economic impacts – all while also insisting on ever-greater efficiency and accountability. Globalization and digitization are just starting to transform the competitive landscape, and will radically reshape higher education over the decades to come. Now more than ever, college and university leaders and governing boards need a comprehensive, big-picture view of the many forces reshaping the sector, emerging trends and long-range projections. Few speakers can engage the full spectrum of higher education stakeholders like Ken Steele. Every year he delivers hundreds of keynotes and retreats that synthesize a vast array of up-to-the-moment research data, trends, news and forecasts, dynamic visuals and media clips, real-time audience polls, strategic insight and humour. Ken’s lateral perspective never fails to spark innovative ideas and out-of-the-box thinking. Read Ken’s biography. Ken speaks on a wide range of topics relevant to higher education, hundreds of times a year, from trends in student attitudes and preferences, innovations in teaching and learning, and changes in program design and delivery, to effective communication, strategic brand positioning, recruitment marketing and social media. Ken custom designs every keynote, workshop or retreat in consultation with you, taking into consideration your audience, their current concerns, your objectives for the event, and the broader context or agenda. Check out the selection of popular topics, which can be delivered as a keynote, an interactive session, or a half-day or full-day workshop. Hundreds of conference organizers have raved about the impact Ken’s keynotes have had to open, close, or sustain their event. Read client testimonials or download the keynote brochure PDF for a detailed list of Ken’s conference appearances. The comments received from our delegates [to the Canadian University Boards Association 2012 conference] suggest that, in addition to being informed, they were also entertained and, dare we say, maybe even charmed. Ken is an energetic speaker who uses vivid images and compelling data to stretch the thinking of his audience. His presentation prompted engaging discussion about the future of our field and our place in it. Click to download the PDF brochure outlining Ken’s approach to conference keynotes and workshops.